Filled with clear, concise guidance and quick, easily implemented techniques, Quick Brainstorming Activities for Busy Managers provides supervisors, managers, and team leaders the fun, proven activities they need to get idea-packed brainstorming sessions started, and keep them going. 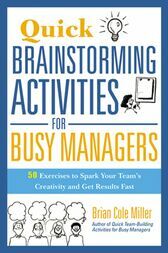 Author Brian Miller helps you explore the most effective brainstorming method for your team and generate the best results using straightforward, focused activities that each take less than fifteen minutes to complete. Readers will discover how to: ask questions that provoke responses and inspire creativity; react to and record ideas in a way that encourages participation and prompts more input; sort and categorize lengthy lists; evaluate ideas; and prioritize the most useful concepts and expand on them. Contrary to popular opinion, great brainstorming sessions don’t just happen. For brainstorming to be a truly productive activity, leaders must create the right environment to let employees’ ideas flow. Complete with sample dialogues and well as resources for virtual team brainstorming, this indispensable book helps readers guide their teams to generate great ideas.